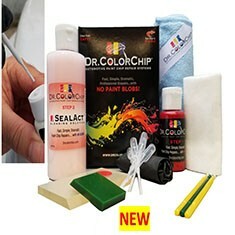 Home > Car Parts > Paint Chip Kits > Dr Colorchip Squirt’n Squeegee Paint Chip Repair Kit..ALL MAKES, MODELS, COLORS! Does you automobile have numerous chips on the hood and front bumper from rocks and debris hitting it? LOOK NO FURTHER!!!!! Introducing Dr. Colorchip!!! This single kit will take care of ALL OF THOSE CHIPS!!! 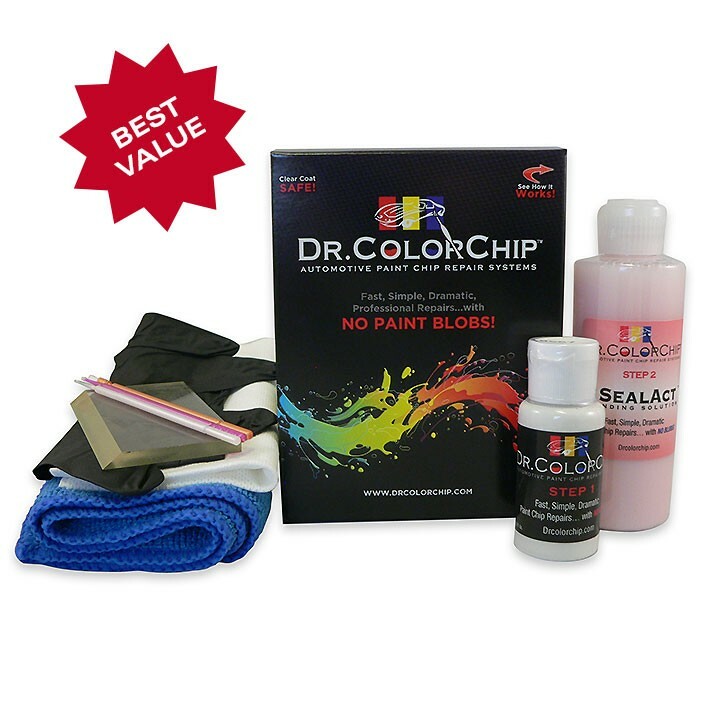 Our #1 Selling Road Rash Kit, but made to more easily address 100s of chips! The paint bottle comes with flip-tod lid to dispense more paint than a brush, and includes our large flexible squeegee. Our simple 2-step process allows anyone to professionally repair chips in a fraction of the time it takes using regular factory touch-up paint or paint pens and provides far better results. Our paint is NOT the typical stuff you can buy at the local auto parts store or any dealership. It is a unique formulation of high-quality automotive tints and chemicals that when used properly, allow it to dry very quickly, enabling you to blend away all the excess paint in just minutes, leaving paint only in the chips. Our blending solution is also a proprietary concoction that is required to complete most repairs. When used according to the directions, you won’t find a faster, more simple and effective way to permanently repair chips. THIS WILL WORK WITH ANY MAKE OR MODEL!!! I HAVE ALL OEM COLOR CODES!!!! NOTICE TO TRI COATS: IF YOU CAR COLOR IS A TRI COAT PAINT, IT IS A 3 STAGE COLOR. THIS MEANS THAT IN THE FACTORY, THE CAR WAS PAINTED WITH A BASE COAT, A MID-COAT(PEARL), AND THEN CLEAR-COATED. 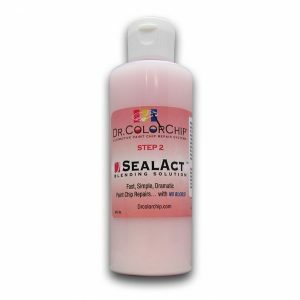 THERE IS NOT A SINGLE COLOR FORMULATION THAT EXACTLY MATCHES THE TRI COAT COLOR. WE HAVE TESTED THE BASE COLOR ON MANY PEARL CARS AND FOUND THAT ALTHOUGH IT IS OFF-WHITE, IT WILL ALLOW THE BEST REPAIR FOR TYPICAL CHIP DAMAGE. 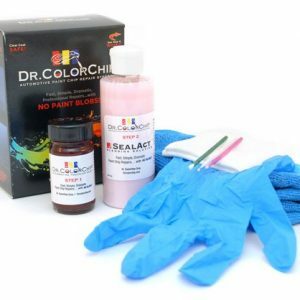 A BRIGHT WHITE WOULD STAND OUT TOO MUCH, WHEREAS THE DIRTY WHITE BASE COLOR WILL BLEND IN MUCH BETTER WITH YOUR CAR’S PEARL-COAT FINISH, AND WILL CERTAINLY LOOK BETTER THAN TRYING TO USE A BASE, PEARL AND CLEAR ON TOP OF EACH CHIP. FOR QUESTIONS, PLEASE CALL PHIL AT 561-313-8162. 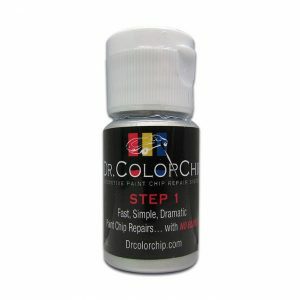 I AM THE EBAY SALES REP FOR DR.COLORCHIP!!! ALSO, I HAVE A YOU TUBE VIDEO THAT DEMONSTRATES HOW THIS WORKS. EBAY NO LONGER ALLOWS LINKS. IF YOU WOULD LIKE TO SEE IT, SEND ME AN EMAIL! WHEN PURCHASING THROUGH STRIPE, PLEASE INCLUDE YEAR, MAKE, MODEL, AND PAINT CODE IN THE EMAIL!!!!!!!!! NOTE: SHIPPING TO PUERTO RICO IS $25 AND SHIPPED UPS. THIS LISTING DOESN’T ALLOW ME TO ADD SPECIFIC LOCATIONS. ALL SALES ARE FINAL……NO REFUNDS!!!!! I HAVE 100% POSITIVE FEEDBACK!!!!!! CHECKOUT MY EBAY STORE AND OTHER ITEMS UP FOR SALE!!!!! IF YOU ARE AN AUTO DEALER, MOBILE TECHNICIAN, SERVICE CENTER OWNER OR MANAGER, PLEASE CHECKOUT MY COMMERCIAL SYSTEM LISTINGS TO ADD REVENUE TO YOUR BOTTOMLINE!!! THERE IS AN OPPORTUNITY FOR YOU TO GET OUR COMMERCIAL SYSTEM WELL BELOW COST AND WHAT IS ADVERTISED HERE ON EBAY!! !CONTACT ME FOR DETAILS!!! !